I grew up with this simple homey dish, tomatoes with eggs, that my mum always cooked to feed us with a bowl of steamed rice. It's quick to make and very delicious. 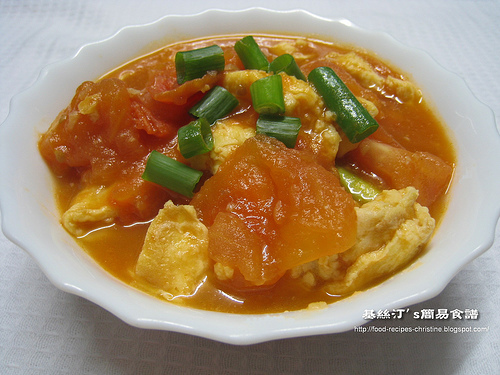 In Chinese cooking, tomato is commonly used to cook with eggs. This dish, Tomatoes with Eggs, is both nutritious and delicious. My kids would eat more rice when this dish is on table. Tomatoes have been shown to be helpful in reducing the risk of prostate cancer, breast cancer as well as preventing from heart disease. Tomato is a very good and healthy food. So, I would cook tomatoes twice or three times a week for my family. When it comes to make this dish, I highly recommend to use brown slab sugar as it gives a complex flavour, taking the whole dish up a level. Slab sugar (brown sugar in pieces), available at Asian grocers. Cut tomatoes into pieces, rinse and discard the seeds if you don’t like it being too sour. Whisk the eggs, add 2 to 3 teaspoons of water. It depends on how big the eggs are. Adding water into the whisked eggs would make them smoother after frying. Add oil on a highly heated wok, fry whisked eggs. Slightly stir and cook until 70% done, set aside. You need to toss them back to cook again, so don’t cook the eggs too long. Heat 2 tablespoons of cooking oil in wok over medium heat. Sauté minced garlic until aromatic. Add tomatoes, sprinkle with salt to taste and stir well. Put in 1/2 cup of water and slab sugar, cook a short while until sugar is dissolved and tomatoes turn tender. Toss in the eggs. When all ingredients heat up again, add thickening and cook to preferred consistency. Pour in a serving bowl, garnish with chopped spring onions. Enjoy ! 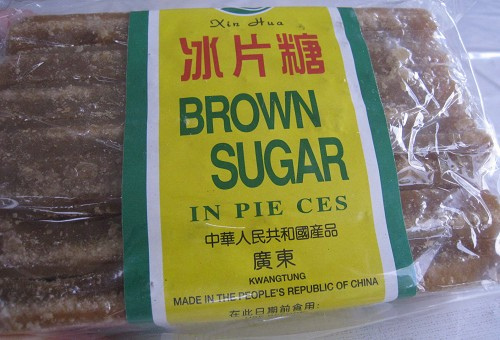 Brown slab sugar (片糖) is made from unrefined cane sugar, giving a complex flavour, available at Asian grocers. Thanks for visiting my blog. After browsing through yours, I am now craving chinese food. Everything looks so good. The answer to your question about pumpkin pie spice can be found here. We can buy it in our grocery stores, near the spices (McCormick), but you can easily make your own using a few different basic spices. Thanks so much. You're so kind to help me out. The info provided on the site is very helpful. Oh, I've already got all those spices in my pantry to mix the pumpkin pie spice. Awesome! I'm going to make a pumpkin bread in a few days. Thank you so much for this recipe! I nearly forgotten the goodness of this dish having grew up on it as a child. Now i m making it for my fussy pot baby girl who thinks eating is a chore. Do you have anymore recipe for kids? my fussy pot is rather picky so i have to alternate recipes once in a while. Thanks! How old is your kid? Does your kid like something that tastes sweet and sour? If so, how about this Sweet and Sour Chicken. Try to cook with lots of sauce. I know many kids like eating rice with sauce. Or you may like to browse through my food blog in Chinese. Pick some recipes that your kid might be interested and let me know. My baby is about 15 months old. I am going through your chinese food blog, though my chinese is really rusty, I am reading it rather slowly. But still its very good! Thank you so much for all your wonderful recipe! I am looking at your soups recipe, do u have anymore easy soup recipes that doesn't take hours to cook? Its summer in Japan now, rather hot. How about Dried Bok Choi and Corn Soup? It's very easy to cook. Sweet corns are very rich in vitamin B, good for appetizing. Another one is my favourite in summers, Winter Melon with Chinese Mushroom and Pork Soup (冬瓜粒湯). Hello Christine, thanks for this lovely recipes. I'd this for dinner today. Hi Christine, I am so happy to have found your blog, I havnt seen this kind of home-cooking since i was a child and i am thrilled to start making some of your recipes. I have been searching for a dish like this for so long now. When i was a child, my mother would always make my favorite dish, very similar to this one. She was would always scoop extra rice for me the night she made her tomatoes. Her's looks very similar to this one but from what i can remember, it was very sweet and contained only tomatoes and a lot of ginger. My dad would is more of a "city" cook as he puts it, has tried to recreate it but his is much less sweet and has ground meat or swirled eggs. My free-hand attempts to recreate it never resulted in the correct sweetness,ginger flavor, or tomato-y-ness. Your recipe above sounds very similar and i am really hoping it is what i have been looking for. Does the description of my childhood variation sound familiar to you? Every family has their own version of making this dish. Your dad's version sounds like my version. Mine doesn't have heavy ginger flavour, as my mum only used a bit of ginger, whereas I use garlic. She likes to use slab sugar (片糖) as picture shown above. This kind of sugar balances the acidity of tomatoes very well. my family loves to make this - I appreciate your instructions that are always above other blogs haha. :) ours is similar except my dad loves ginger so of course I had to fry up some along with the garlic. next time I'll add the egg back at the very end because I found when I add it early, the dish gets more orange/yellow. Thanks for your appreciation of my instructions. Yes, some people like adding ginger to get a bit of hot hint.